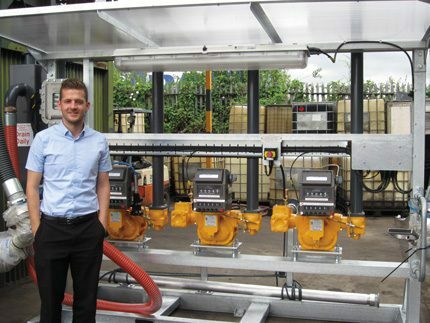 Nick Goodwin besides Standard Fuel Oil’s new Alpeco bottom loading skid. Following the commissioning of the new trucks, Alpeco was asked to quote for the supply and installation of a 3-arm bottom loading skid,” said Adrian Baskott. The skid is equipped with Liquid Controls M25 mechanical flow meters capable of loading rates up to 1100 litres per minute with all of the necessary safety features needed to provide a safe, reliable and economic solution when loading road tankers. Installation was carried out by Alpeco’s sub contractor STK who kept operational disruption to a minimum by keeping the existing top loading bay operational whilst the new skid was being installed and commissioned. The 2014 tankers feature Alpeco’s 5 compartment BLVR and Actiman manifold system and Alpeco MF800 bulk metering system with TE550 electronic register and metered uplift facility. Standard also has a further two new tankers on order. Both will be fitted with Alpeco equipment including the new TRUCK III electronic register with inventory and cross over prevention software. In the September issue of Fuel Oil News, Nick Goodwin talks about the company’s development since its inception in 2011.